The Austin City Council must decide by June 1st whether to launch a landmark challenge to the Travis Central Appraisal District over the undervalued commercial properties in this year’s tax appraisals. You can help convince them make the right decision to go forward with the appeal. Come to the City Council Chambers at 301 West 2nd Street, this Thursday May 28th. Bring your neighbors and friends. Email, text, Tweet and Facebook the link to this blog posting. We have obtained a 4:00 time certain for speakers on this topic, which is Item #4 on the agenda. You can sign up to speak, using the kiosks in the lobby of the Council Chambers anytime between now and Thursday’s meeting. Please keep in mind that this is not an adversarial action against the TCAD appraisal officials. They have been very cooperative with our City Council members and City staff. This is the legally required process to correct major flaws caused by the Texas appraisal system. The law does not require sales price disclosure on either residential or commercial real estate transactions. Here are some new developments on the Council’s pending decision on the appraisal challenge. 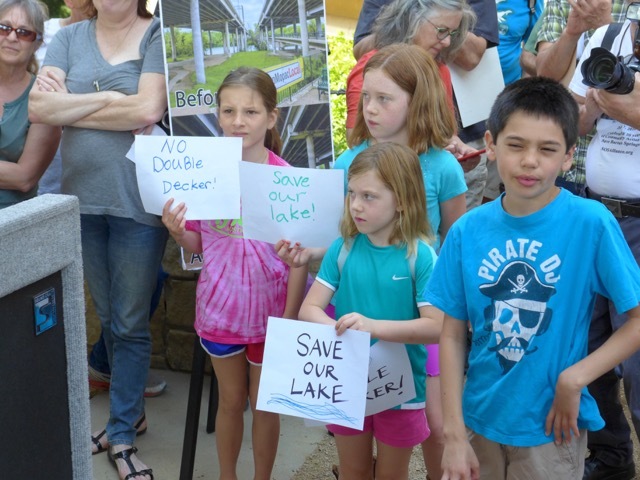 Two major stumbling blocks could cause Travis County, AISD, or any of the other taxing entities in our area to oppose Austin’s challenge to TCAD. Both involve a potential delay in TCAD’s new certification of the tax rolls after the revised commercial appraisals have been calculated. For one thing, taxpayers who usually make their payments to the Travis County Tax Office at the end of the year might lose the opportunity to do that, and then lose their Federal income tax deduction for this year. But a solution to that problem was discussed at Tuesday’s City Council Work Session. A plan is underway to allow taxpayers to pay an estimated tax by the end of the year and still use that for their Federal tax deduction. Then they would simply make a final supplemental payment once the new tax rolls are certified and final tax bill amounts are determined. With these tax receipts coming in, the taxing entities would not face a delay in receiving the revenues needed to fund their operations. We’ll see you in the City Council Chambers on Thursday afternoon. We are one step closer to ending the egregious inequity of undervalued commercial properties that has plagued residential taxpayers for too many years. For more information on the flawed Texas appraisal system, please visit Real Values for Texas at this link. Read their report and watch their excellent video. This entry was posted in Action Alerts and tagged Austin, Austin affordability, Austin Property Taxes, Austin tax appraisal challenge, Austin tax appraisals, Travis County taxes on May 26, 2015 by Bill Oakey. The storms that swept through Blanco, Wimberley, San Marcos, Kyle and other communities near Austin brought historic flood levels in some areas. Homes have been damaged or destroyed and people, pets and livestock have been injured or displaced. If you would like to donate or find out where to volunteer, please contact the Austin Disaster Relief Network using this link. Or, you can call them at 512-428-6322. Their address is 1122 East 51st Street, Austin, TX 78723. The entrance to their office is facing 51st Street. This entry was posted in Action Alerts and tagged Austin flood, Austin storm, Central Texas flood, San Marcos flood, Texas flood, Texas flood relief, Wimberley flood on May 24, 2015 by Bill Oakey. If you missed the big “Keep MoPac Local” Rally on Saturday, please take a moment to enjoy some photos from the event. Then mark your calendars for this coming Thursday, May 7th. Plan to come and join the gathering of citizens at the Council Chambers at 301 West 2nd Street. 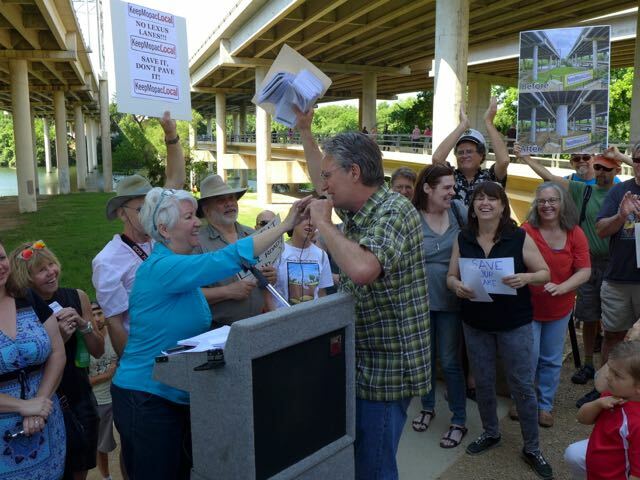 You are urged to come at 4:00 PM and support Item 26, which is a resolution opposing the construction of new toll lanes over MoPac through Zilker Park and across Lady Bird Lake. Speakers can sign up at the kiosks in the City Council Chambers from now through Thursday. You can see the resolution here. The resolution is sponsored by Mayor Pro-Tem Kathie Tovo, and co-sponsored by Council Members Ann Kitchen, Leslie Pool, Gregorio Casar and Delia Garza. 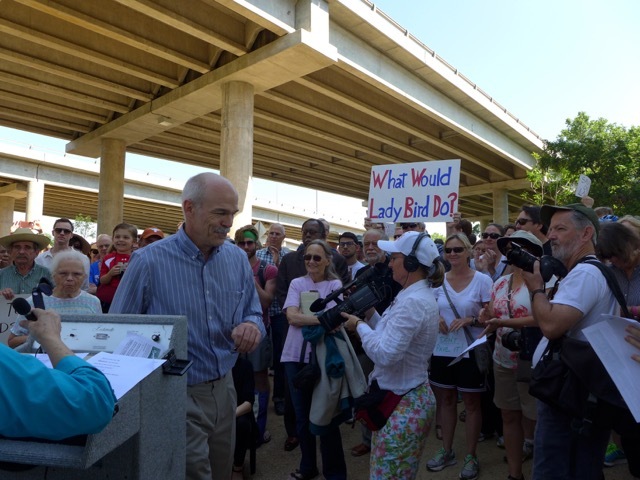 Why Should We Oppose Four Toll Lanes Over Lady Bird Lake? This project is not a transportation plan. It is a TRANSFORMATION PLAN! If you are a wealthy homeowner in a new subdivision built over the Edwards Aquifer Recharge Zone, then you might love this new tollway and the bridge. It will only cost you upwards of $12 to $14 per trip to use the lanes. That adds up to a whopping $504 to $588 per month for 21 workdays! 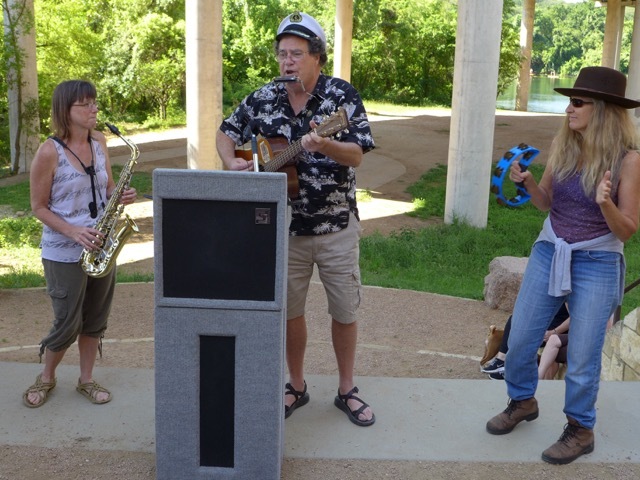 And many of us are opposed to the added noise and pollution in Zilker Park near and along the Roberta Crenshaw Pedestrian Bridge. We don’t like the idea of dumping thousands of cars onto Cesar Chavez at Austin High School as a route into downtown. The ultimate goal of this project is to connect SH-45 SW, I-35 and MoPac, transforming local streets in Central Austin near downtown into a totally gridlocked traffic nightmare. 1. Attend -This Tuesday, May 5 at 10:AM – Travis County Commissioners Court, 700 Lavaca. Toll Road Authority presentation. 2. Attend and Oppose – Next Monday, May 11 at 6:00 PM – Joe C, Thompson Conference Center, 2313 Red River, Room 3.102. The Capital Area Metropolitan Planning Organization (CAMPO) will vote to adopt the 2040 Transportation Plan. 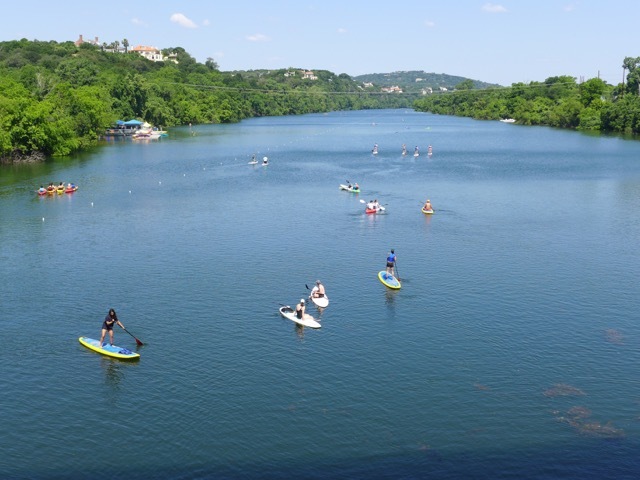 Come and speak against the Southern MoPac lanes over Lady Bird Lake. (Oppose inclusion of the 4 toll lanes on South MoPac, SH-45 SW, & Connection to I-35). 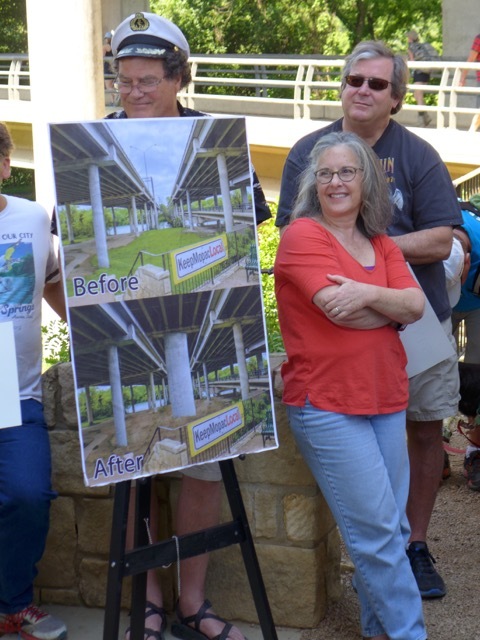 Tremendous thanks to the many volunteers who worked to put the rally together and to keep us informed about the financial and environmental encroachment of toll roads over Lady Bird Lake. One person really stands out. Brigid Shea, the founder of SOS back in the 90’s, and now one of our Travis County Commissioners, did a fabulous job helping to organize the rally and serving as MC. Click to enlarge the photos. This entry was posted in Action Alerts and tagged Austin, Austin affordability, Lady Bird Lake, MoPac, MoPac Toll Lanes, Zilker Park on May 3, 2015 by Bill Oakey. The State Legislature has convened a joint House / Senate Budget Conference Committee. This committee will iron out the differences between the House and Senate versions of the budget. We need to support the Senate version, which provides $2.4 billion in property tax relief. The House version contains no property tax relief, and would only give a tiny reduction in the sales tax. Here is a link that describes the Senate’s proposal for property tax reductions. I urge everyone to email or call the House members of the Conference Committee listed below. Ask them to support the Senate’s recommended property tax reductions in their budget negotiations. Let them know that Austinites are struggling to keep up with sky high taxes and double digit appraisal increases. Please email, Tweet, and Facebook this blog posting to all of your friends and other contacts and ask them to do the same. Click each name to send an email. Phone numbers are listed on each page. If you belong to a neighborhood organization or have access to any organization newsletter, please see that this appeal is posted. Try to get it circulated on as many blogs and forums as possible. This entry was posted in Action Alerts and tagged Austin, Austin affordability, Austin Property Taxes, Austin tax appraisals on April 30, 2015 by Bill Oakey.